The brilliant sparkle of the oval pair diamonds make them a great choice for diamond stud earrings. They are also fantastic as side stones for three-stone rings. A pair of oval cut loose diamonds has all the brilliance and shine of a round diamond, with that little extra distinctiveness you may be looking for. Oval cut diamond pairs are often used as the stones for diamond stud earrings or as side stones in a three-stone ring. 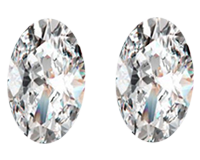 We have oval diamond pairs ranging in size from 0.6 carats to almost 2.5 carats. Whether you are looking for a pair of VVS1 clarity loose oval diamonds or I2 clarity with a high F color rating, we will be able to find your ideal loose diamond pair. We can also customize any jewelry setting with both a center stone and side stones.